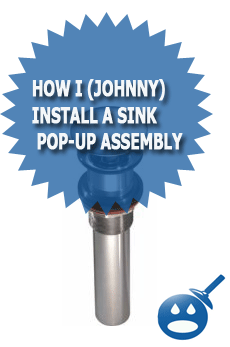 Installing a bathroom sink pop-up assembly is a job that many people even plumbers have trouble doing without having leaks. Some people in an attempt to not have leaks even resort to putting Silicone RTV sealant all over the sealing surfaces of the pop-up assembly, essentially gluing the pop-up in place. The truth is that installing a pop-up assembly without leaks is an easy task once you know the one important step that was left out of the directions. When installing a pop-up assembly there are two pieces. The upper piece is the flange, which ends up in the sink basin. The lower piece is the part the ball rod goes into which controls raising and lowering the pop-up. There are some differences between brands and how they go together, you will need to vary the assembly somewhat to the type you have. The top piece or, flange requires a bead of plumbers putty to seal the flange to the sink when tightened in place. On some porous materials the oil in plumbers putty may stain the sink, I recommend using Hercules Sta-Put Ultra Plumber’s Putty, which is safe on all materials and will not stain. 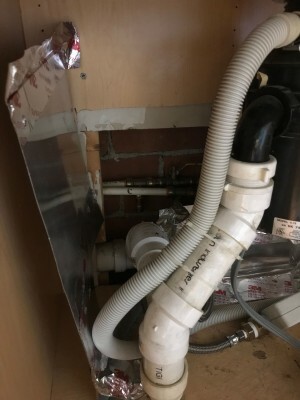 If this putty connection leaks the only consequence is the water in the basin will slowly leak down the drain instead of staying in the basin. Now the important part! Under the sink a nut draws the top piece or, flange in the basin, tight with a thick rubber washer sealing to the bottom of the sink. This thick rubber washer called a Mack Washer usually seals very well against the sink bottom but does not seal well against the threads. The Mack Washer is the all-important seal that keeps water from leaking under the sink when water goes down the drain. On the threads that the Mack Washer will end up lying against when the nut is tightened, coat the threads with a Teflon pipe dope such as RectorSeal T Plus 2. The pipe dope will help seal the threads preventing the Mack Washer from leaking. This is the single most important step to having a pop-up assembly, which will not leak. 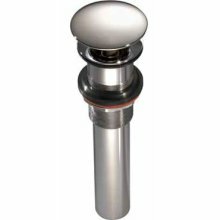 When the Mack Washer Nut is tightened the ball rod should point straight back and any non-gasketed connection such as the tailpiece threading into the ball rod housing should be connected with a small amount of Teflon tape with paste applied over the tape. Follow the instructions for your pop-up assembly for the balance of the installation. The coating of the threads under the Mack Nut with the Teflon pipe dope is the single biggest key to a successful leak free installation of a pop-up assembly. This info was right on point! I’ve been struggling with leaking pop-up assemblies (3) all weekend until I tried the pipe dope. The instructions on the assembly failed to mention the need for pipe dope, but it sure did the trick. Why would the assembly manufacturers not mention using pipe dope to prevent leaks? Rediculous. Thanks so much, this is exactly what was the problem with the new bathroom sink pop-up I installed. Wish the plumber at Lowes had told me this tip when I bought the hardware.